6 Mil Blue Vinyl Tape is a highly durable UV-treated poly-vinyl tape that stays in place for up to 6 months yet removes easily without leaving residue. This industrial vinyl tape protects surfaces providing good abrasion, impact and rupture resistance. Resists aging, sun, water, fungus, bacteria, oil, acids, alkalis, and corrosive chemicals. Used in a variety of other applications: decorating, striping on vehicles, boats, sporting equipment, etc. ; masking of printed circuit boards; harness and pipe wrapping; duct and joint sealing. Resists aging, sun, water, fungus, bacteria, oil, acids, alkalies, and corrosive chemicals. This works great for us on our workout matts that get ripped edges. Saved us the cost of replacing them and they still look good. Thank you for your review. Wow, what a great application for our 6 Mil tape. We're always learning about new applications for our products. Worked well, color was close.. I bought this tape to put up temporary dust barriers in commercial buildings because of the claim of no residue...but the only opporturnity I have had to use it it did leave a good bit of residue which makes it unuseable in my application. 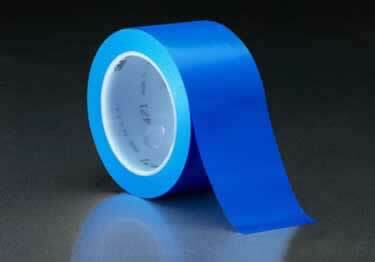 Tha tape is a heavy vinyl and will not tear easily so you will need to use sissors or a knife to cut it. It would make a great substitute for duct tape and a good patch for blue tarps. This is very good product, i will recommend this product if you want to use. Easy to use and durable protection for automobile lockout entry. Best price around, I purchased several rolls for all my drivers. I ordered this tape for the purpose of adjoining carpet sections for an event we were doing at the Induction ceremonies at the national Baseball Hall of Fame. All I can say is that the carpet didn't move an inch. High 5's on this product!! The shipment had an earlier than expected turn around. Has great holding strength with no residue and works great for protecting surfaces like glass. I use it every day at work a real life saver! Great costumer service and very polite. I had entered the wrong expiration date on the credit card info, and immediately got a call to confirm. It was totally my mistake, but the sales rep was very nice. My order was shipped immediately!